The Art of "Spirited Away"
"Spirited Away" is the most popular film in the history of Japanese cinema. "Spirited Away" even surpassed "Titanic's" phenomenal box-office take in Japan. 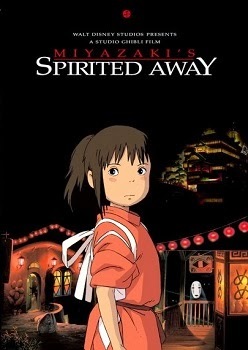 Earlier this year "Spirited Away" became the second film to win the Oscar for Best Animated Feature Film. I was pulling for "Lilo and Stitch" that night. I had never seen or heard of Hayao Miyazaki's masterpiece. I spoke with Stephen Wong after I watched the three Miyazaki DVDs I received from Disney. I couldn't agree more with Stephen's assessment: "Miyazaki is the Kurosawa of animation." "Spirited Away" is an enchanting, enthralling and amazing journey into a world that few could even dream of. Chihiro (Daveigh Chase) is a ten-year-old girl moving with her parents to a new town. Chihiro is sullen and distraught at being uprooted. Chihiro's father takes a wrong turn within site of the family's new home. Being a typical male, he decides to forge ahead, rather than listen to the wife. The trio finds themselves without any more road. Ahead lays an ornate pagoda; curious, moss-covered idols are scattered about. Father knows best, so the family enters the tunnel leading through the pagoda to what lies beyond. Chihiro and her parents wander into what looks like an abandoned amusement park based on medieval Japan. There is not another soul in site. While Chihiro is cautious, her parents find a buffet and literally make pigs of themselves. At this point "Spirited Away" enters a fantastic world which makes Alice's adventures in Wonderland seem like a boring Muzak induced coma. As night falls, Chihiro finds herself trapped in a world of spirits. The action centers around a bathhouse where the spirits come to refresh themselves. Chihiro must find a way to turn her porker parents back into humans and return to the land of the living. Chihiro meets numerous bizarre and original characters. Yubaba (Suzanne Pleshette) runs the bathhouse. Yubaba will keep Chihiro from returning to the world of the living if she is able. Kamaji (David Ogden Steirs) is the spider-like man who runs the boiler, which heats the bathhouse. Haku (Jason Marsden) is the mysterious young man who may or may not be Chihiro's guide back to the land of the living. I must admit that there are themes in "Spirited Away" which escape me due to my lack of knowledge of Japanese philosophy and symbolism. Nevertheless, "Spirited Away" is still a totally engrossing film. According to Stephen Wong, Hayao Miyazaki is looked on as almost god-like by the animators at Disney. I can see why. With the exception of "Akira," my previous exposures to Japanese animation and anime have left me cold. Miyazaki's animation is bar none, the best in the world. His use of color, detailed drawings and rich attention to detail make "Spirited Away" a film you will want to watch over and over in order to take everything in. Miyazaki's palette provides endless surprises and pleasure. Unsurpassed beauty. "Spirited Away" has been given a rich, elegant transfer, which bursts from the screen in a kaleidoscope of imaginative images and colors. Miyazaki's attention to detail is presented in a combination of rich and muted colors. You will be amazed at how much there is to see. Miyazaki fills each frame with more detail than is usually found in many epic live-action films. No pixilation or delineation problems. Well-saturated colors with crisp clear detail all the way to the edge of the frame. I watched the English and Japanese versions. The English version is wonderfully dubbed. The Japanese version is also crisp and full. Jo Hisaishi's score is magnificent. Both tracks have excellent balance between all of the ranges. The sub-woofer is integrated so-well into the rest of the channels, that I wasn't jostled once by the sudden blare of the bass line. The tonal quality is excellent. Full, rich tones throughout the entire range of sound. Hisaishi's score is very subtle at points. The light lilt of piano underscores certain bits of dialogue. Beautiful French horns resonate through other scenes. With so many characters flooding the screen, there is quite a bit of background dialogue and ambient sound. From the muffled sound of ghost talk to breaking glass and buzzing flies, this soundtrack will give everyone's home theater sound system a workout. Beautiful menu design which makes great use of Miyazaki's dazzling images and Hisaishi's score. Easy to navigate. No Easter Eggs found. Disney director John Lassiter introduces the film with great passion. After watching the movie, there are tons of great extras to enjoy. "The Art of Spirited Away" is a 15-minute featurette covering Miyazaki's work on this masterpiece. It includes interviews and behind the scenes footage. "Behind the Microphone" covers the dubbing of the English version. All major cast members are interviewed. There are over 20 original Japanese Theatrical trailers with subtitles. These trailers last almost 30 minutes. "The Making of 'Spirited Away'" was my favorite extra. This 42-minute TV special was produced for Nippon TV. The documentary is a very up-close and personal recording of the making of "Spirited Away." The film documents the incredible pressure to deliver "Spirited Away" on time. The film crew captures the tension and team work as the animation staff completes all of the key animation in 18 months. The TV special is in Japanese with English subtitles available. All stages of the film's production are chronicles. This TV special could be a blue print to other studios wanting to produce animated movies. The DVD also includes a selected storyboard to scene comparison. There are also numerous Sneak Peeks to many Disney releases including two more Miyazaki films. "Spirited Away" is a masterpiece. This movie deserves to find an audience in America. Those who miss this film are missing something very special indeed.